Save your Community Money … and Announce it! The photo in this post is from a gas station at a local grocery store. 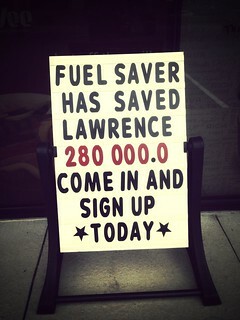 They put up a sign at the gas station showing how much money they saved a community via their fuel points program. How cool would that be to use one of those library value calculators, add everything up for a year, and share how much money the library has saved the community – in books, videos, and events attended? For some libraries, this could be a really BIG number! Has anyone done something like this before? If so, did it work? I’d love to know – please share! Recently, the Pew Internet & American Life folks released this about ebook lending at public libraries. It’s part of their Libraries, patrons, and E-books report. Here’s the pull-out quote: “Most Americans are unaware of e-book lending at their local public library.”Â Then it goes on to the stats:Â 76% of public libraries lend ebooks … and most Americans really don’t know if their library has them. I know. There’s a lot in the current ebook/publisher/distributor landscape that you can’t really change at the moment. Yes, yes, together we can and probably will create some ebook changes. But for now, your single library can’t change the price of an ebook to a fairer price; you can’t get 27 checkouts from HarperCollins books; and you can’t call up Penguin and beg them to sell you ebooks, even though they don’t sell to libraries … and have them cave in and make an exception in your case (well, unless you happen to be a large NYC library, perhaps). But there is one thing … One Thing! One thing that you CAN do, and we apparently AREN’T DOING IT.Â And that’s actually telling people that you have ebooks that can be checked out. What’s up with that? Guys, this is simple stuff … and putting up a link to Overdrive on your website does not count. mention it in Twitter and Facebook. More than once. Get an interview in the newspaper, at local radio stations, and on the local TV news station. So – those are some starter ideas. How about you? 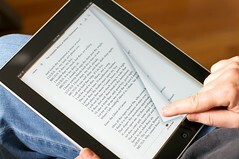 How have you successfully told your customers that you do, in fact, have ebooks? let’s share, and turn this silly pew statistic – this horribly pathetic Pew statistic – around.